We Can't wait to welcome you at another FIN AND TONIC: on the Future of International Payments. As the global economy continues to roar with a vengeance, the international payments' space is growing accordingly. Currently, McKinsey is predicting an 8% growth through 2018 in this sector, with major areas of growth throughout Asia and Western Europe. While traditional players have strong advantages in capitalizing on these business opportunities, players outside of the industry are also taking notice. A number of which are making inroad into this space, introducing new digital technologies which make for easier, more convenient options and raising the expectations of consumers around the globe. 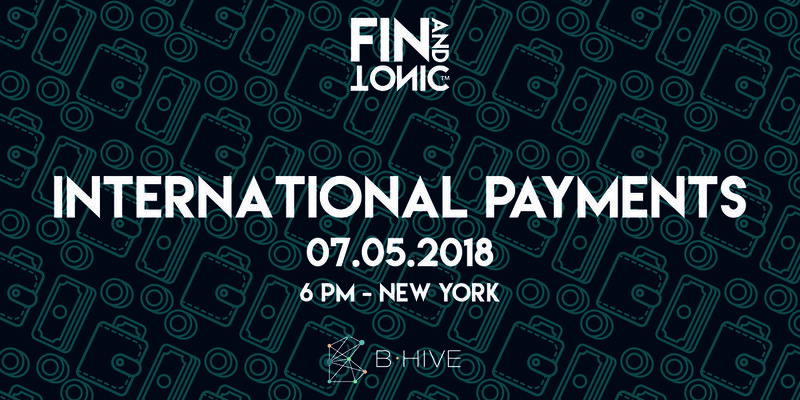 Please join us for the latest edition of FIN AND TONIC where we will explore the landscape of the Future of International Payments with a diverse group of panelists, who will share their unique perspective on how this transformation will unfold. Will Liu, CTP is a Regional Manager for SWIFT with diverse accounts covering multi-national banks to Corporates based on the East Coast. Will is currently dedicated to providing deeper education around SWIFT offerings and how it can provide greater cash management and payment initiation optimization while achieving both cost savings and standardization. Prior to joining SWIFT, Will worked as a relationship manager and liquidity specialist for large corporate clients at J.P. Morgan. He graduated Cornell University and lives in Brooklyn, NY. Andrew Boyajian is the Head of Banking for TransferWise’s operations in North America. At TransferWise, he progresses the digital payments space by closely studying existing banking infrastructures and unearthing solutions that better match and exceed customer expectations. Prior to TransferWise, he served as Director of International and Payments at Kickstarter, where he was instrumental in turning a nascent North American idea into an international phenomenon, launching the crowdfunding platform in 17 new markets. He graduated from Elizabethtown College with a BS in International Business and began his career with Financial Operations roles at Google and Eventbrite. Andrew lives in Brooklyn and in his downtime, he hopes to step foot on the last one or two continents that he hasn’t explored yet. David Lighton is the founder of SendFriend and a MIT Legatum Fellow at MasterCard Foundation. He is a FinTech entrepreneur who is passionate about bringing benefits of technology to diverse communities. He used to act as the Special Assistant for Haiti at the World Bank. His blockchain remittance startup, SendFriend, has won multiple prizes at MIT, including MIT Legatum Fellowship and MIT TIA Award. David graduated from John Hopkins University where he earned his B.A. in International Relations and M.A. in International Economics. Monica Murthy is the Program Director at Empire Startups, the largest community of FinTech entrepreneurs, investors, and banking professionals in the world. Empire’s mission is to foster collaboration in FinTech, and support startups as they scale. At Empire, Monica is a connecter in the FinTech ecosystem. She hosts community events and works with startups and financial institutions to find innovative solutions to bridge gaps in the industry. Prior to joining Empire, Monica worked at the British Embassy promoting international trade policy and working with small businesses to expand in other markets. Monica has worked in several different tech verticals, from homeland security technology to advertising technology, and now financial technology. Monica graduated from American University with a B.A. in International Studies. David Lefferts is an executive with strong knowledge across the board in both capital markets (equities, fixed income, derivatives) and banking/payments (high-value and real-time). He has a track record in guiding early stage companies into large global enterprises as well as developing new products/businesses within mature companies. He is currently a partner at Expand Research. He has also worked as a Managing Director at Markit and SWIFT. David earned his MBA at Columbia Business School.